Singer-songwriter Niall Horan was recently reported to have bought property in his hometown of Mullingar, but the One Direction star has now revealed that he isn't currently based in Ireland, saying he has to make "sacrifices" to pursue his music career. The 23-year-old troubadour spoke to RTÉ News's Sinead Crowley on Wednesday ahead of a performance on Eoghan McDermott's 2fm show, where he spoke about his desire to be based at home. "I still have to live abroad as the music industry takes me elsewhere at the minute, but I try and get home as much as I can," he said. "It's not always easy, and I do miss it, but these are the sacrifices you have to make. I would love to live in Ireland but at the moment it's just not feasible for me." On Tuesday night, Horan kicked off his Flicker Sessions world tour and unveiled tracks from his upcoming debut album at a rapturously received show at Dublin's Olympia Theatre. The singer said it was that in hindsight it was "the best idea ever" to play his first solo gig in "the homeland." "I think it went really well, the reaction to some of the songs that they hadn't heard has been really good." Horan said. The gig was a "huge change" compared to One Direction's stadium days, but Horan said he enjoyed getting up close and personal with the audience, saying it's "something you have to relish". "I've been lucky enough to play in the likes of Croke Park with the big stage and some of the best moments of my life have been in that setting with big stadiums and big productions and lights and the whole lot of it, but it's nice with the kind of music that I'm making to bring it down to that smaller, more intimate level," he said. "[There's] no better place to start than one of my favourite theatres I've ever set foot in. I've been to a lot of gigs in The Olympia over the years so it was nice to play there." Horan went on to explain that he feels most comfortable on stage with a guitar in his hand, adding with a laugh: "During Slow Hands I don't have a guitar and I don't really know what to do with my hands, so I just picked up the Irish flag that was on the floor beside me, I was a bit all over the place! I just feel most comfortable with the band around me." 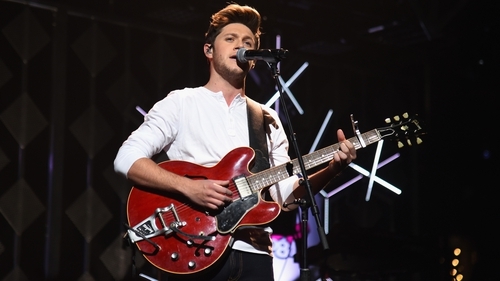 Read Harry Guerin's review of Niall Horan's Olympia Theatre gig here.